Physicians and their patients, medical policy makers and licensing boards, pharmaceutical companies and pharmacies all must work together to stem the opioid epidemic and achieve the fundamental objectives of reducing addiction and deaths. With so many players and data sources, today’s information is partial, fragmented, and often not actionable. We don’t have the data to understand what’s happening, to adjust policy, and to motivate physicians and patients to change their behaviors. 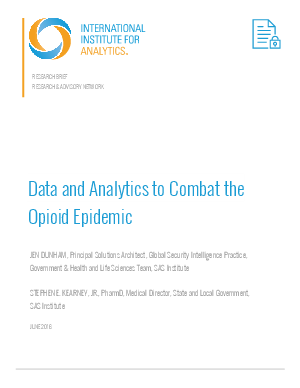 Better data and analytics can help develop better treatment protocols, both for pain in the first place and for remediation when patients are becoming dependent on the drugs.